These two photos were taken in the same place but a year apart. The area is called Virgin's Breasts near Abbassia Barracks, Cairo. The top photo is of the last mounted parade of the 7th Hussars, 5th March 1936. 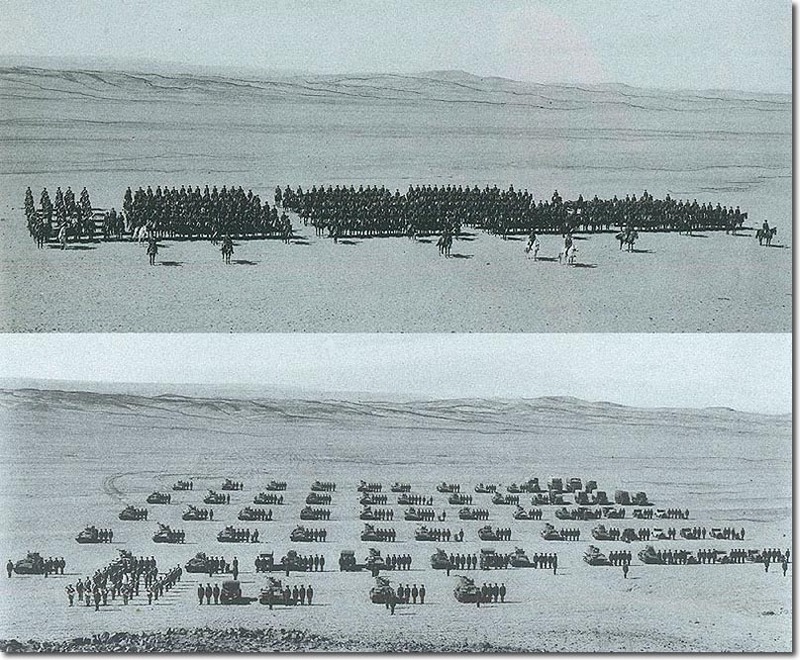 The lower photo is of the first mechanised parade of the regiment, 2nd march 1937. The mounted parade shows 3 squadrons with HQ on the right of the photo and the band on the left. The CO and trumpeter are on grey horses at the front of the parade. The band are still on the left of the lower photo but on foot. The CO no longer has a trumpeter. Each of the vehicles is parked with it's team standing next to it. They are mostly Vickers Mark IV light tanks.